We now come back to the original point of the last objection the critic may have in recognizing both Damascene Cosmology and Christianity to be true, in the Incarnation God changed. Certainly, to say “God became man” is an accepted phrase or that “God dwelt within Jesus” is part of our orthodox beliefs. But does this indicate that God changed in the Incarnation? It is true that the person of Christ took on a human nature, but this does not mean that the Word changed. In taking on a human nature, the Divine nature did not mold with the human nature. Jesus was not a third type of nature, a Christian version of some Greek myth where he is part human and part God. In the person fo Christ the whole divine nature and the whole human nature existed, not as a composed single substance, but as two natures within one person. When Christians speak of the mystery of the Incarnation the mystery they refer to is that two natures existed within two people. How such an event can be accomplished is beyond us, but it is necessary to understand that Christ, though one person, had two natures and acted through both natures. Both natures worked together and in perfect harmony, meaning that the person of Christ experienced life as a human without giving up who he was as God. When the Divine nature, a nature the Word participated in, took on a human nature this did not change the divine nature. 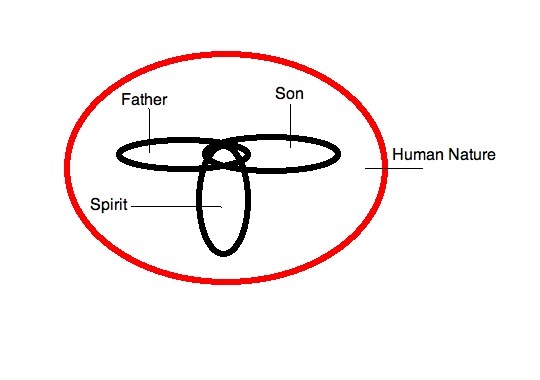 Nothing change in the Father, the Word, or the Spirit and they remained as they were prior to the Incarnation. What was true of the Word prior to the Incarnation remained true after the Incarnation. Any new things we could say about the Word we were saying about his human nature and not about his divine nature. When we say that “Jesus suffered,” implicit within such a statement is, “The human nature within the person of Christ suffered while the divine nature did not suffer.” Again, this is a mystery how the person of Christ could both suffer and not suffer, but it is not a contradiction because of the two natures; it would only be a contradiction if one nature existed. In the first example we see that the whole of God takes on the human nature. That means the divine nature is subsumed into the human nature. The persons of the Father and Spirit, as well as the divine elements of the Word, are then transported completely within the human nature. But the view is illogical. How can the finite hold authority over the infinite? Instead, the second example is what Christianity has taught for nearly 2,000 years. 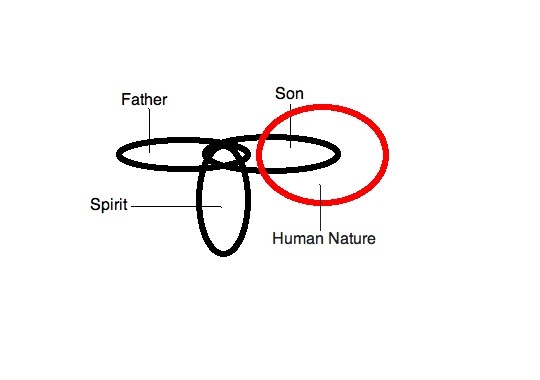 We see that the Son still holds his divine essence with the Father and Spirit, but has also taken on a human nature. In doing this, the Word remained the Word; he did not lose knowledge, he did not lose infinity, he did not lose glory, he lost nothing and did not change. He took on a human nature without changing or lowering his divine nature. This is possible because the two natures did not fuse, did not become one, did not mix and match; the two natures existed in whole within the person of Christ. Christ had the whole nature of God and the whole nature of man present within him. We see within the Incarnation that Christ worked through both natures and that both natures, though not one, worked together in the person of Christ. We see that Christ gained knowledge in his human nature, but already knew the thoughts of those around him in his divine nature. Christ healed people in his divine nature, but needed food, water, and rest in his human nature. While the how is elusive and remains (and will forever remain) a mystery, such a view is not a contradiction. As a person, Christ could have felt suffering in one nature without feeling it in another. For instance, as an example I can feel pain in my hand (physically) without it affecting my psychological state (immaterial). Likewise, I can lose a dear friend and suffer psychologically, but will not suffer materially. As an example this shows how two substances within a person can function without both being affected, but the person being affected. Therefore, it is not outside the realm of possibility that Christ could feel and experience something in one nature that he couldn’t in the other nature. Again, this is a mystery, but not a contradiction. Is it appropriate to say that God changed in the Incarnation? The answer is a definite no. For one, in the Incarnation the nature of God did not change. The divine nature remained the same and unaffected by the carnal flesh. Since the Word has the divine nature, this means the Word remained unchanged. Can we say that the Word changed in the Incarnation? Again, the answer is no. The person of the Word remained unchanged in the Incarnation. As an example, if I put a jacket on I am not changed. Likewise, in putting on human flesh, the Word did not change. Any change we notice in Jesus is solely attributed to his divine nature. We must never forget that the human nature didn’t inform the divine nature, but rather the divine nature informed the human nature. Thus, in the Incarnation God does not change, but rather changes us. Once again, even in the Incarnation, God is the mover and remains unmoved. Posted on August 5, 2010 July 12, 2010 by Joel	This entry was posted in Damascene Cosmology, Philosophy, Theology and tagged apologetics, Christ, Christianity, God, incarnation, Jesus, Philosophy, Religion, Theology, Trinity. Bookmark the permalink.